Cerebral Small vessel disease accounts for about 25% of the causes of Ischaemic stroke and over 40% of the cases of dementia. It is recognized as a major vascular contributor to dementia, cognitive decline, gait impairment, mood disturbance and stroke. 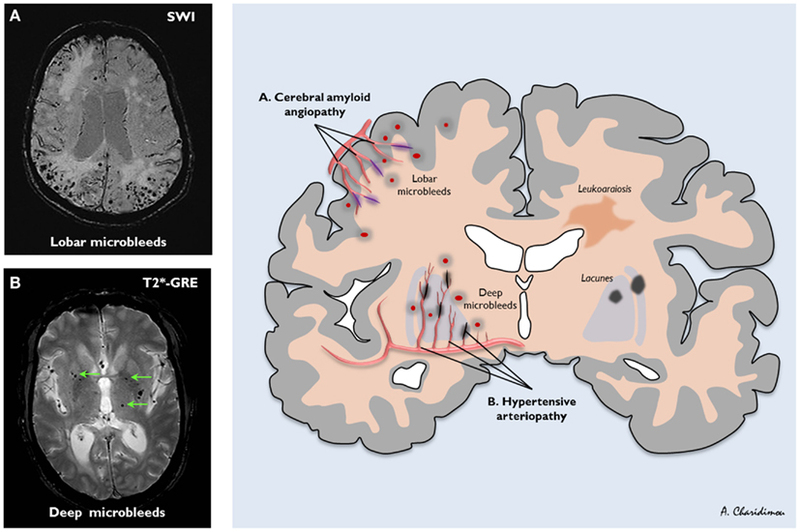 It is commonly seen in elderly on CT/MRI but there is a wide disparity in neuroimaging appearance and clinical findings which can range from nothing to mild cognitive impairment to dementia or gait dyspraxias and more. It is also the main underlying pathology for deep bleeds which are discussed in the chapter on haemorrhagic stroke. It is closely associated with Hypertension Small vessel disease cannot be imaged in vivo so we use surrogate markers - namely lacunar infarction and deep haemorrhages as evidence of its presence. Important caveat is that small vessels disease can be due to large vessel disease such as proximal MCA embolic occlusion which may reperfuse after causing localised deep infarction or large plaques in larger vessel which can encroach on the ostia or branching small vessel causing occlusion. Multiple acute lacunar type infarcts may suggest embolism. 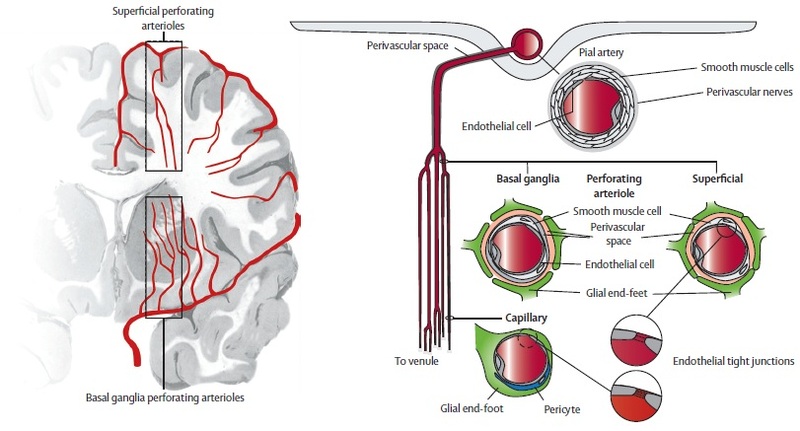 Small vessel disease is as its name suggests a disease predominately of the small penetrating arterioles usually less than 800 um in diameter. They often are found branching off sideways from small and medium sized arteries which come off the circle of Willis or vertebrobasilar systems. There may be some over exposure to high blood pressure as there is not the steady reduction in vessel calibre seen in other systems. The occlusion of these small vessels can lead to predominantly white matter damage and demyelination with axonal damage and scarring. In most cases a process called lipohyalinosis which seems different to atherosclerosis occludes the vessels. Other processes exits including amyloid and inherited genetic defects. The result is small deep hemispherical or brainstem (mainly pontine) strokes usually less than 15 mm in diameter. Age, Hypertension and diabetes appear to be risk factors. Same pattern of disease may also be seen with CADASIL, Fabry's disease, Vasculitis, migraine and other uncommon causes of stroke [Pantoni L 2010]. Don't forget that it is also disease of these small vessels that can lead to the classically deep haemorrhages that can be disabling or fatal. This classification and table need not need memorised but what is important is to realise that small vessel disease is mutifactorial with a broad differential and is in reality a number of pathological processes all affecting the small penetrating vessels. 1 : Arteriosclerosis Commonest form. Pathology shows Fibrinoid necrosis, Lipohyalinolysis, Microatheroma, Microaneurysms. Similar disease seen in kidney and retina. Associated with increasing age, diabetes and hypertension. 2 : Sporadic hereditary amyloid Beta A4 Amyloid deposition in walls of small and medium sized arteries and arterioles. May be blood extravasation. Associated with Alzheimer disease. Association with microbleeds on MRI. Unsure who gets microbleeds and others get large bleeds. Clinically the effects are often subclinical but slightly larger occlusions can lead to lacunar infarcts which can certainly present with the classical lacunar syndromes discussed elsewhere. A more piecemeal damage can lead to a progressive vascular dementia, Gait apraxia and vascular parkinson's as deep white matter is affected as well as subcortical nuclei and their connections. Imaging is useful and CT often shows hypodensity most distinctly around the ventricles with associated cerebral atrophy. Conventional MRI is useful to diagnose SVD but does not capture the heterogeneity of SVD lesions. The changes are felt to be the tip of the iceberg of the total SVD-related brain damage. MRI is much more sensitive and shows increased signal on T2 and FLAIR. It is a very similar appearance and distribution to demyelination. Resulting lacunar infarcts are usually round and less than 1.5 cm in diameter. Diffusion weighted imaging is useful to pick these up acutely. With Small vessel disease other MRI with gradient echo may show evidence of microbleeds showing the two sided nature of this disease. Doppler and Echo have probably less importance but should be done where indicated and where there is diagnostic doubt if this was a small vessel stroke or cardioembolism with a shower of small emboli occluding vessels. Consider genetic causes in younger patients (Fabry's disease, CADASIL). Usually due to age, hypertension and diabetes that seem to be the main risks. Most patients would be started on an antiplatelet and receive lipid reduction and smoking advice. The SPS3 trial has shown that there is no benefit in giving dual antiplatelet therapy (aspirin and clopidogrel) rather than aspirin alone in these patents [Benavente O 2011]. In the setting of acute stroke, those with SVD should be considered for thrombolysis. The exact connection between small vessel stroke and larger vessel strokes is not fully understood. Carotid disease should also be addressed in those with symptomatic carotid disease and small vessel disease.